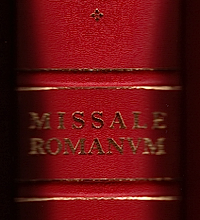 Nor can one honestly look upon this decimation of the Missa Latina Tridentina as some accidental happening of Church history, when one considers how the Novus Ordo Missae also manipulated an unholy coup to deromanize the sacred rubrics of the traditional Latin Mass, including all the current dilutions and disruptions of the priestly role by the laity, and especially the inclusion of Communion in the hand as well as its concomitant inundation of sacrileges throughout the once orthodox Roman Catholic world. Nor does this devastation stop here when one considers how the experts under Pope Paul VI manipulated untraditional and unorthodox prayers into the corpus of the Novus Ordo Missae with the simultaneous dislocation and eradication of significant doctrinal truths, as the traditional prayers of the Missa Latina Tridentina in English translation from the Latin were jettisoned. Truly, the original new mass under Paul VI barely resembles today's variations with the pillagers of change ever at work to innovate more and more versions. Finally, we must observe the collateral damage of this destruction caused by the Novus Ordo Missae and its cohort of scholars under Paul VI: the elimination and downgrading of sacramentals, the rosary, holy water, benediction, exorcisms, confession, blessings, icons, and even churches themselves. One asks why we must have today-- and at no other time in Church history--two masses, two priesthoods, two lectionaries, two rubrics, two traditions, two theologies, and two catechisms? Indubitably, the explanation is to be found in the intense liturgical warfare since the conclusion of Vatican Council II and Pope Paul VI's reign that has pitted the new mass against the traditional mass in an unholy and unfortunate competition. Clearly, we live under the veil of a divided liturgy, divided Church, and divided flock that is floundering about and praying for the decisive control of a strong shepherd's hand. What shall we do?